« the blue sitting room », « the pantry « , the studio-sitting room ». One then enters the artist’s first studio, in which he worked until 1899. This room later became a cosy sitting room, where coffee was served, comfortably installed in English-style cane chairs and surrounded by familiar objects, photographs and the Master’s paintings. A first staircase leads to the floor on which are the private rooms. First, we discover Monet’s bedroom, which underwent in 2013 a meticulous scenographic reconstitution. Objects and artwork from Monet’s day are displayed in the bedroom and in the adjoining bathroom, including reproductions of paintings by his friends: Cézanne, Renoir, Signac or Caillebotte. The visit continues through their dressing rooms and on to Alice’s bedroom, leading to a tiny sewing room. Damasked tablecloths sewn together cover the walls of both bedrooms. Finally, the last room on that floor, Blanche Hoschedé-Monet’s bedroom which was opened to the public for the first time in 2014. 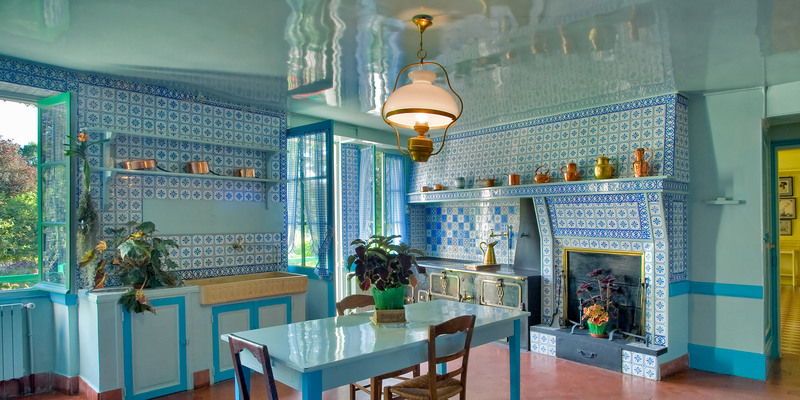 As in Monet’s bedroom, Hubert Le Gall was responsible for the scenographic reconstitution, inspired by interiors from that period in order to recreate as close as possible the surroundings of Blanche who lived in Giverny until her death in 1947. The dining room has been restored with precision. One can admire the collection of Japanese « estampes » on the yellow walls. The furniture ,also painted yellow, was considered very modern at the time. In the glass cabinets are displayed the blue earthenware crockery and the yellow and blue set , ordered by Monet for special occasions. In the kitchen, with its blue Rouen tiles, the impressive cooker with multiple ovens and the copper utensils seem to be waiting for the return of their owners.